Stir Fried Chinese Egg Noodles with Oyster Sauce | Simple. Tasty. Good. 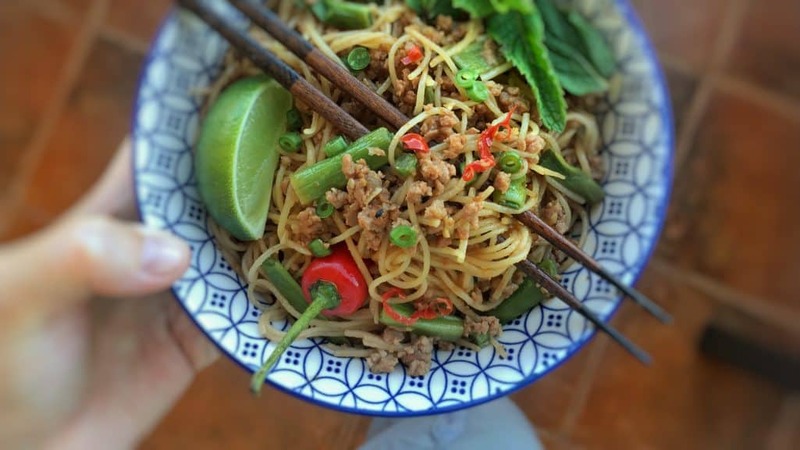 Craving a quick and easy Asian dish for dinner? Then here’s what you need: my 10-minute stir fried Chinese egg noodles with vegetables in oyster sauce! I love Oriental sauces but my favorite is oyster sauce. Do you cook often with oyster sauce? Or do you like to prepare any Asian recipes from time to time? Because cooking Asian isn’t really hard to do, on the contrary. Once you got just a handful of those basic Asian ingredients in your fridge or pantry you’re well on your way. Noodles are a great way to start learning how to cook Asian. My stir fried Chinese egg noodles below are a perfect example of that. 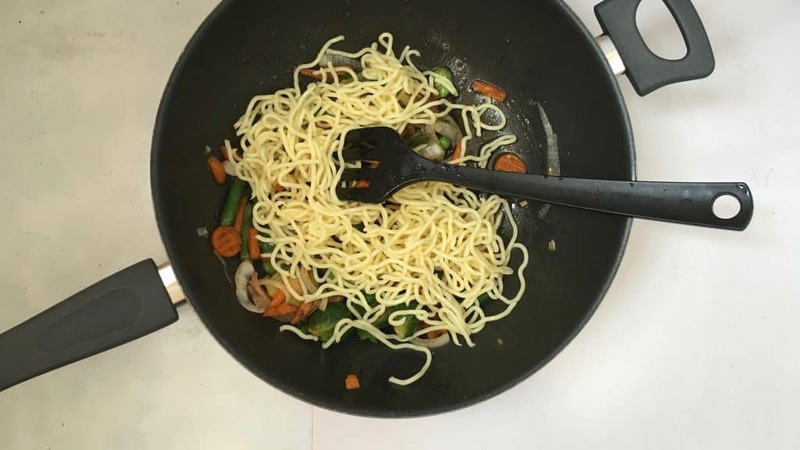 Stir frying vegetables and noodles is a piece of cake and a great meal option if you are looking for a quick but satisfying dinner. 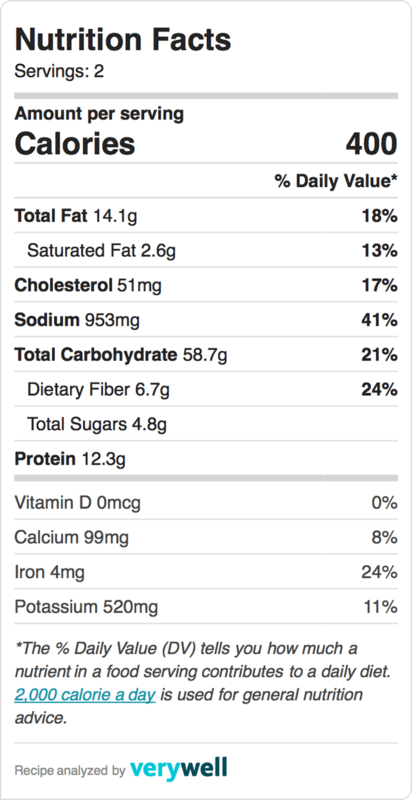 The only thing you have to focus on here is to get that flavor balance right between the oyster sauce and the soy sauce. That’s a crucial point. Both sauces are quite powerful and I guess that you could even do without the fish sauce and sesame oil if you haven’t got those in our pantry. Just a tad of those sticky 2 sauces turns it into a great and explosive flavorful Oriental dish. Love noodles dishes? Then also check out my rich soy sauce noodles with caramelized onion! What vegetables could you use here then? I added fresh Brussels sprouts, sliced carrots and chopped green beans but any other type of vegetable such as fresh broccoli, cauliflower, spinach, green peas or bok choy are also fine. Whatever vegetable you can find! Just keep those veggies chunky and crunchy! Good to know also: you can easily replace the egg noodles in this recipe by cooked rice for instance and turn this recipe into delicious vegetable fried rice as well. Or use that heap of leftover cooked spaghetti in your fridge from last night’s dinner! Double yum! 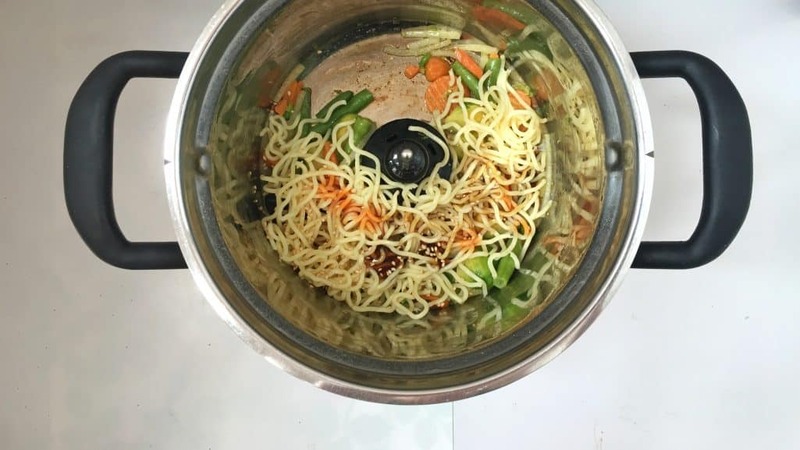 I also prepared this stir fried Chinese egg noodles in my KitchenAid Cook Processor: scroll down to the second recipe for step by step pictures! Pour the vegetable oil in a large non-stick pan or wok and place it over medium heat until the oil is hot. Then add the halved Brussels sprouts together with the mashed garlic and sliced onion. Stir well. Gently fry the vegetables for 4 minutes. Chop the green beans into bite-size bits. Slice the carrot. Add both green beans and carrots to the sprouts in the pan also. Stir well. Let the colorful vegetables gently fry for 3 more minutes. Don’t burn them. Then sprinkle the vegetables with the oyster sauce, soy sauce, sesame oil and fish sauce. Add 3 tablespoons of water. Season the vegetables with a pinch of pepper. Stir the vegetables well again and cook them for another minute. Add the precooked noodles. 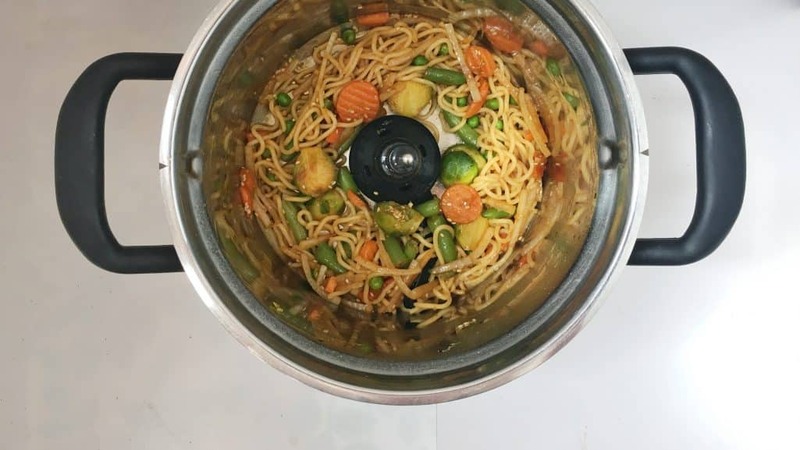 Stir fry the vegetables and noodles for 3 minutes. Then check the seasoning and add extra pepper, oyster sauce, fish sauce, soy sauce or sesame oil to taste if necessary. Take the wok off the heat and scoop the stir fried Chinese egg noodles and vegetables into large bowls. Drizzle with the remaining oyster sauce marinade if there’s any left in the wok. Sprinkle the noodles with sesame seeds and serve immediately. Boy I will repeat it for as long as I live: how I love oyster sauce in meals. Is there anyone as oyster sauce crazy like me also? Because I like to use oyster sauce a lot, especially in combination with quick vegetable stir fries or noodle dishes just like this Chinese egg noodle stir fry below. Always a good dinner meal idea! 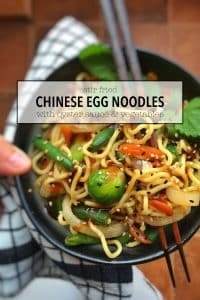 This stir fried Chinese egg noodles recipe literally takes only like 20 minutes or so to prepare. 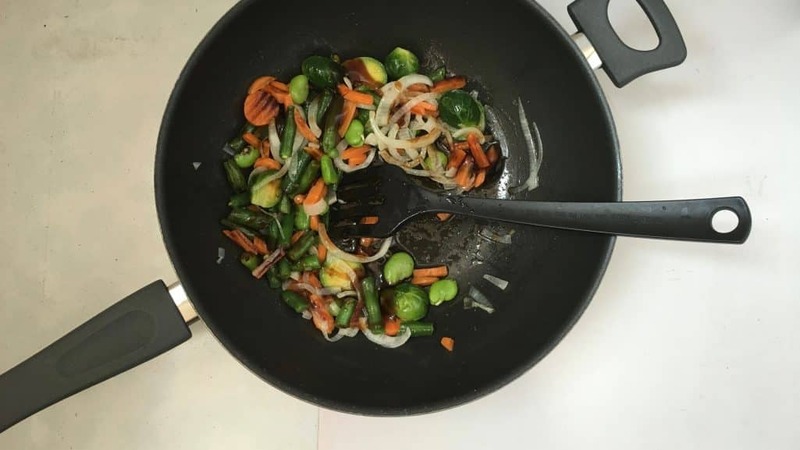 First fry the vegetables, then add some cooked noodles and season it to perfection with Asian flavors. Plain and simple. 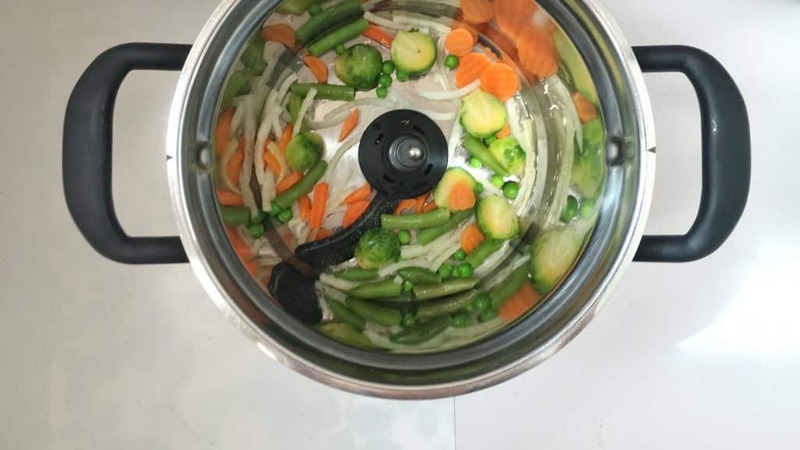 A perfect stir fry recipe that I also prepared in my gorgeous KitchenAid Cook Processor! Here we go. 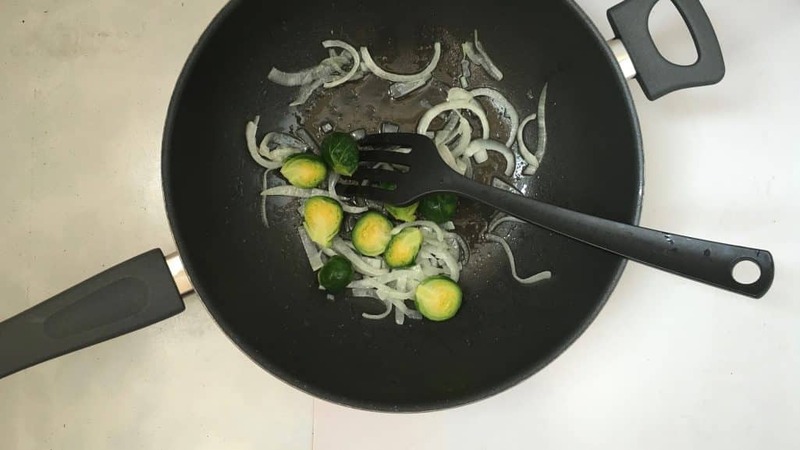 Pour the vegetable oil in the bowl of the Cook Processor and add the halved Brussels sprouts, the mashed garlic, the chopped green beans, the sliced carrots and the yellow onion. Close the bowl and select FRY 2. Press Start to activate Step 1. After that, add the cooked noodles to the bowl. Drizzle with the rest of the ingredients: the oyster sauce, the soy sauce, the sesame oil and the fish sauce. Add 3 tablespoons of water as well. Season the vegetables with a little pinch of pepper as well. Close the bowl of the Cook Processor and press Start to activate Step 2. 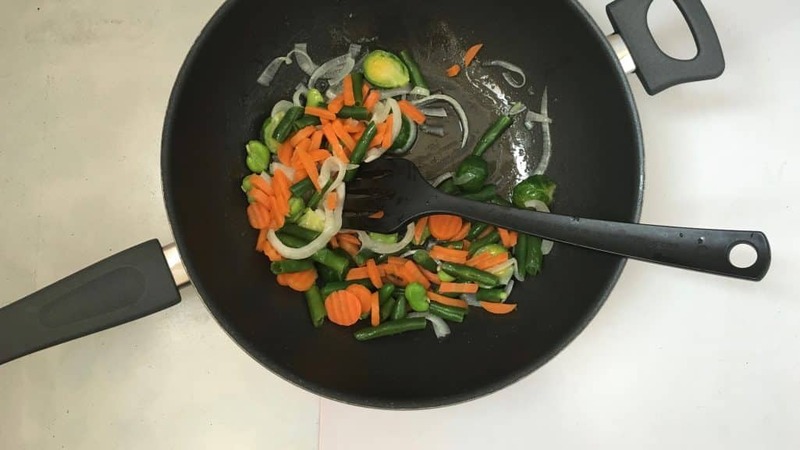 After that check the seasoning of the noodle stir fry and add extra pepper, oyster sauce, fish sauce, soy sauce or sesame oil to taste if necessary. Scoop the hot noodle and vegetable stir fry into large bowls. Drizzle with the remaining oyster sauce marinade if there’s any left in the wok. Serve immediately. This noodle recipe is not an egg noodle one this time. Gosh I’ve been looking for those shiny almost transparent glass noodles lately but I just don’t seem to find them here anywhere. Let alone find an Asian supermarket here on this Spanish island. 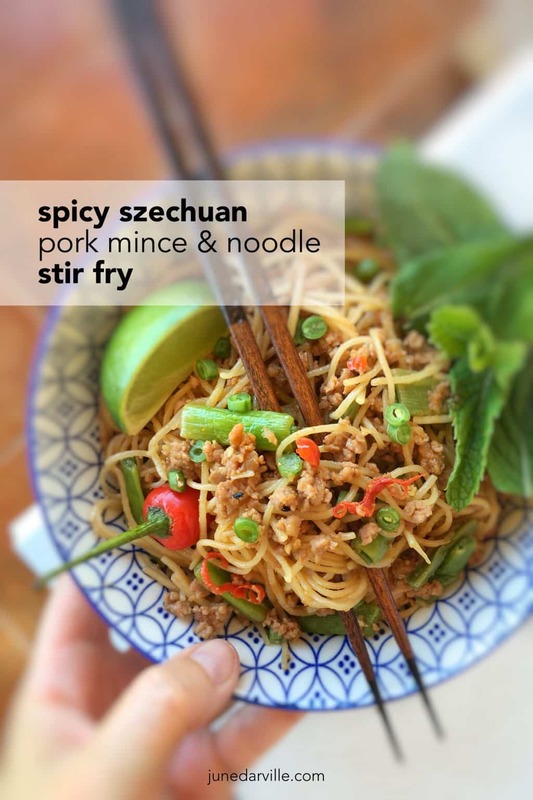 Glass noodles would be just perfect for these stir fried spicy szechuan noodles! No worries, I used rice noodles instead. I actually wanted to prepare a szechuan dish with a funny name: ants climbing up a tree. Looks delish! But because I can’t find the traditional glass noodles, well then I had to adapt the recipe a little and keep the original for later when I find the good noodles. Never mind, these rice noodles are mouthwatering good as well. I usually add them to a fresh springrolls filling. I just love the spicy heat of this noodle dish! Just in case you can’t find red miso or fermented bean paste? Then replace it by a mixture of oyster sauce, tomato paste and anchovy paste to get that strong flavor base. Enjoy! Check the instructions on the package of the rice noodle to know how to prepare them. After that, pour the vegetable oil a wok and add the grated ginger and sliced garlic. Place the wok over medium-high heat. Stir fry the ginger and garlic for a minute and then add the red chili and miso paste (or bean paste, or a substitute I mentioned in my introduction text above). Quickly stir fry the ingredients for another minute and then add the ground meat. Stir fry the meat mince well for a couple of minutes until cooked through. Break up any large meat lumps. When the mixture is too coarse, I sometimes pour the mince in a blender, pulse quickly and add it back to the pan. Don’t make the mince too fine though. Then add the beef stock, the bowl sugar, the fish sauce and the soy sauce to the meat mince. Bring the ingredients to a good boil. Then add the soaked rice noodles and freshly chopped spring onion. Stir the rice noodles once and then put a lid on the wok. Let the rice noodles cook for another 5 to 6 minutes or until tender. Scoop the spicy rice noodles into large bowls and serve piping hot. What is the difference between egg noodles and Italian pasta? Is the are difference at all? 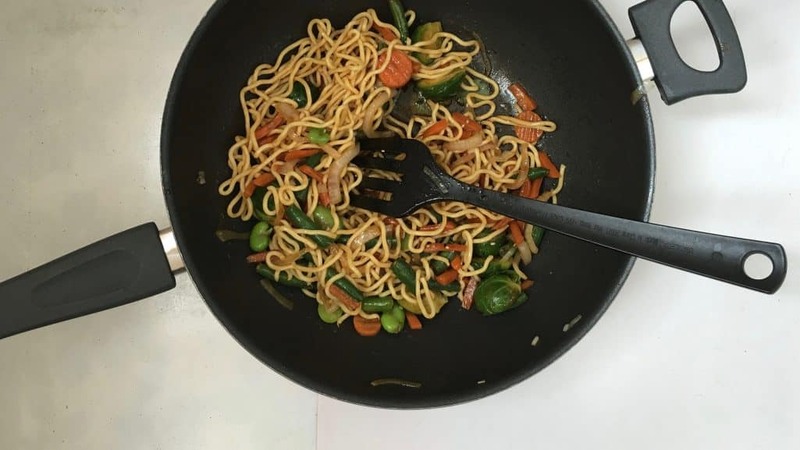 Noodles, who doesn’t love noodles! I could eat them every single day to be honest because they are so addictive. But just one little last closing thought here. Have you ever wondered what the difference is between Chinese egg noodles and Italian pasta then? When I make pasta from scratch, I also use flour and eggs. But my fresh pasta in the end is miles away from any type of Chinese egg noodles that I have ever tasted! So why is that? So what is the difference exactly between Chinese egg noodles and Italian pasta? Well the difference can be found in the type of flour that is used for Italian pasta and Chinese egg noodles. For Italian pasta semolina flour is mainly used. That’s finely ground durum wheat. Chinese egg noodles on the other hand can be made with a larger choice of flour made out of grains such as buckwheat, whole wheat and even rice. Another difference that I found out about not so long ago: pasta is made with egg yolks whereas Chinese egg noodles are prepared with whole eggs. Well that’s an interesting thing to know, right?